Rich in antioxidants, pomegranate is increasingly recommended for a healthy heart, anti-aging and disease prevention diets. 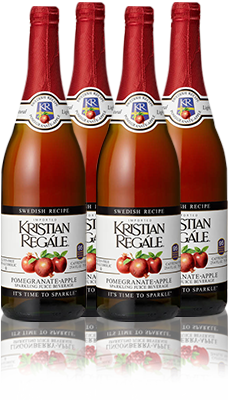 Kristian Regále Pomegranate-Apple Sparkler is made with delicious, all natural pomegranate juice. Purified sparkling water, apple, pomegranate and aronia concentrates, beet sugar, natural flavors, citric acid.